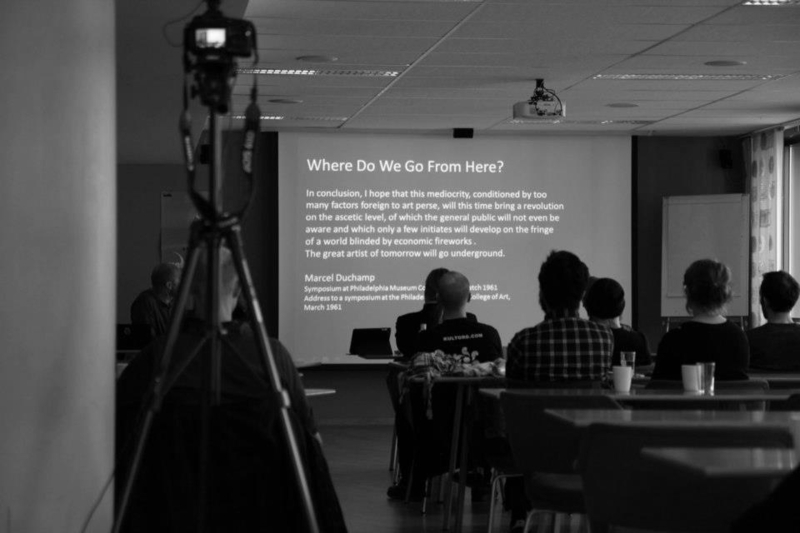 The HERE TO GO series started in October 2012, when a full day conference on art and contemporary esotericism with the launch of an accompanying book was held in Trondheim, as an intrinsic part of the Meta.Morf Biennale for Art & Technology. 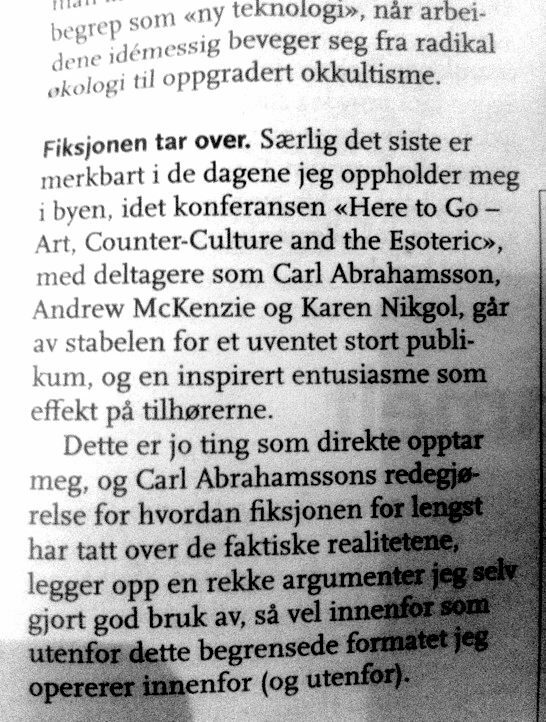 I had been in regular touch with Carl Abrahamsson after I first organised a Forum Nidrosiae event at Trondheim Academy of Fine Art with him in 2010, and we had subsequently discussed the possibility of creating a conference like this. 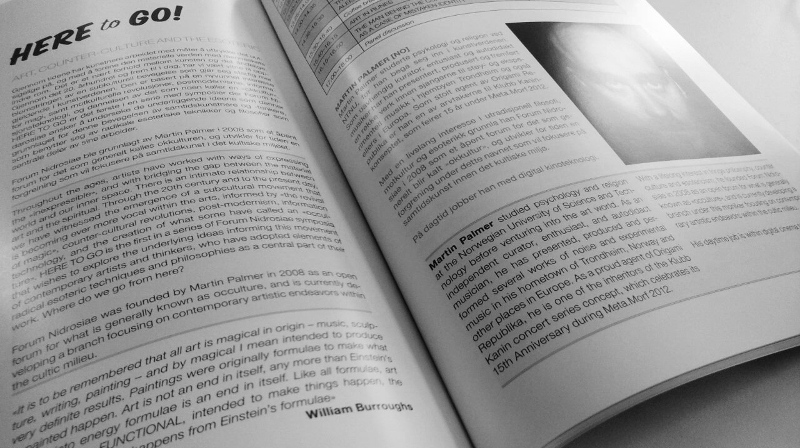 Here To Go started with the name, as a nod to the late great mentor and collaborator of William Burroughs, namely Brion Gysin, taken from the book Here To Go: Planet R-101, where Gysin discusses art and magic with Terry Wilson. To quote Carl, to say that Gysin's and Burroughs' work on upheaving traditional views on writing, painting and magic has been important is a severe understatement. We had both been great fans and students of their work for several years, and to honour their important achievements, we decided to make Here To Go as a more or less regular event, focusing on art and ideas that - in one way or the other - can be said to be related to their legacy, and to occulture in a broader sense - although we would not try to define what's not there, i.e. some kind of homogeneity in terms of attitudes over the decades, but rather to catch expressions as they pass by and look for patterns and signs. The first Here To Go event was held at Nova Hotel and Conference Centre on 20 OCT 2012. It attracted a diverse crowd of 70 participants and received several positive reviews. On the panel was Carl and myself, along with the South African artist, writer and film-maker Kendell Geers, musician and writer on occult history Gary Valentine Lachman, international sound artist, 'complemationist' and Gysin collaborator Mr. Andrew M. McKenzie of The Hafler Trio, as well as the Norwegian-Iranian artist Karen Nikgol and Forum Nidrosiae regular Dr. Jesper Aagaard Petersen. The New York based artist and occultural icon Genesis Breyer P-Orridge was invited but could not attend. However, s/he contributed a text to the book we published as a part of the conference, as did each of the speakers. Here To Go 2012 was a full day conference in pure lecture format, with a lunch and book launch, as well as a workshop and concert with Andrew M. McKenzie the days before (mentioned in the local newspaper here), and a screening of a documentary on Brion Gysin's Dream Machine (introduced by Mr. McKenzie) and Marie Losier's film about Genesis and Lady Jaye in Trondheim Cinematheque the day after. It was all very well received. You can read more about the HTG2012 presentations here and buy the book in my webshop. ArtSceneTrondheim wrote a review of the event and stated that "Forum Nidrosiae represents an academic backyard, as necessary as it is reinless", while Billedkunst, the official journal of the Norwegian Visual Artists Association (NBK), wrote that "art, counter-culture and the esoteric may sound like a narrow basis for a book, but it is not. Here To Go is an interesting guide to how you in practice can transform your experiences and the way in which you are processing your senses." Artist and critic Tommy Olsson was also present, and reported back to Morgenbladet that Here To Go dealt with ideas he had a direct interest in, and that we attracted a "surprisingly large crowd, with an inspired enthusiasm as effect on the listeners." Carl Abrahamsson sums up the event on his blog, where he concludes that after an illuminating day, "the chilly Trondheim evening air was a-buzzing with experimental concepts and intellectual pipedreams of the very best kind – the inspiring kind." 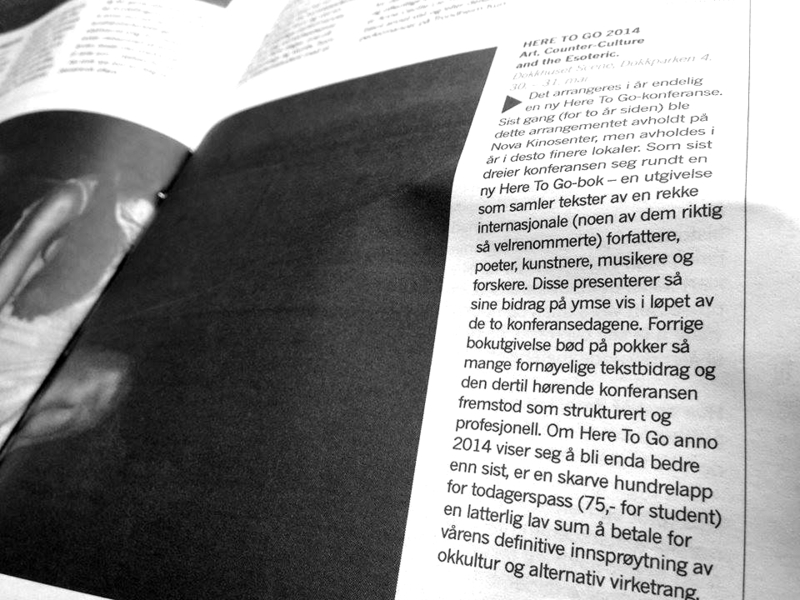 After the success of the first event, Here To Go II grew to become a two day festival held during the weekend of 30-31 MAY 2014 at Dokkhuset Scene, with the first night dedicated to concerts and performances, and day two focusing on lectures, presentations and panel discussions. In addition, the night before I organised one of the rare opportunities to experience industrial legend Z'EV's Yantra Tantra performance, an event occuring in the complete dark, with the participants lying on mats. The purpose of the Yantra Tantra is to produce a synaesthetic experience in the listener, so that the audio becomes visual and people are seeing what they are hearing. This phenomenon happens because of phosphene activity. We used Trøndelag Theater's Black Box for this, with all six sessions fully booked. On the Here To Go II program was Carl with Thomas Tibert aka Cotton Ferox, Z'EV of course, Vicki Bennett aka People Like Us, Peter Grey and Alkistis Dimech from the renowned independent publishing house Scarlet Imprint, artist and author Angela Edwards, and Dr. Jesper Aagaard Petersen. As in 2012, we had also prepared a book containing the presentations or other material from the speakers, to be launched at the event. You can read more about the performances from the opening night here, and find details on the speakers and their talks here. You can get the book in my webshop. 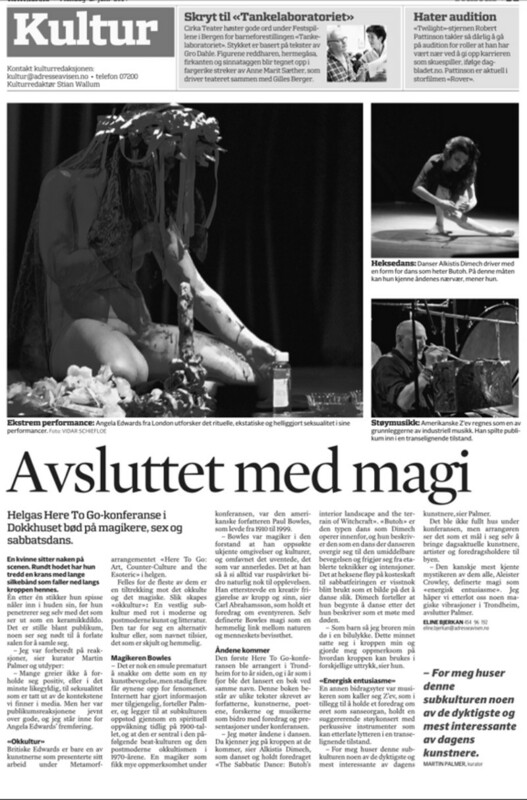 The HTG2014 event received a full page positive review in the culture section of the major regional newspaper Adresseavisen (see scan), and an indepth article in the Danish music magazine Seismograf, who recognized Here To Go to be part of "an occulture that is moving away from the music underground and in the direction of more established cultural institutions", yet "constantly shifting between the borders of the visible and the invisible". According to them, this anti-movement is becoming a subject of research with growing urgency, and represents "a form of recuperation on behalf of the existing cultural institutions". Scarlet Imprint called Here To Go 2014 an important occultural moment, which gave them "the opportunity to present their work at an international event and which drew together some of the luminaries and founders of industrial music and occulture, respected academics and the next generation of practitioners and performers." Carl summed everything up on his blog, calling it "a joyous event" that had become "elevated to a higher level of resonance and quality". A big thank you to TEKS and Espen Gangvik for supporting the project. Here To Go III is pending. "One wonders what makes certain people appear at the correct time/space intersections to make a maximum impact. It doesn't need to be loudmouthed enfants terribles forcing their way, nor fey, evanescent and misunderstood geniuses generating emotional vacuums for others to fill. Some artists simply leave a trail of very tangible history behind them. And they attract both interesting people and events as they go." Between all things are strata of experience, stimulating by similarity the tendency to remember and to inherit. We emerge from one thing into another leaving crypto-psychism of our knowledge which, ghostlike, lives on, adumbrating our fatalities whereby our past constantly re-enters us. What we reactivate is determined by our belief, will, desire and action. "When you cut into the present, the future leaks out." - William Burroughs, Breakthrough in the G.R.